Get ready for an exciting adventure through a stunning tropical paradise where you will hope to bump into the Toucans, which call it home, in order to land high-flying wins that will see you return time and time again. While it feels like there has been a slot machine created based on almost every animal in existence, the 1 Can 2 Can slot machine developed by NextGen Gaming focuses on Toucans which we haven’t encountered before. These are famous for their distinctive long beaks, vibrant colours, and large bills, and you’ll thoroughly enjoy seeing them fly onto the reels as they drop extra Wilds into random positions to provide you with memories (big wins) that you’ll never forget. Consisting of 5 reels and 25 paylines that can be adjusted, the 1 Can 2 Can slot machine enables you to set feet on the tropical paradise from as little as 25p up to a maximum of £50 thanks to the low value of coins offered. While there is a stunning waterfall to admire, you’ll find that the biggest rewards of all come from trekking through the vegetation in order to find fruits like kiwi and pineapples to feed to the Toucans as a treat (some might say bribery) for transforming positions on the reels during the base game and the sensational bonus features that are included. The setting truly is stunning with you wading through thick green vegetation and tropical flowers to reach an opening where you’ll see clear water flowing from a waterfall that you can drink to cool down in the soaring heat, and the symbols that have been designed by NextGen Gaming are just as stunning to look at, not to mention very lucrative! The Wild symbol simply states the word and it is just as vibrant as Toucans are in reality as it boasts a plethora of bright colours with a spiral animation playing out in the background whenever it lands, and this is the most lucrative symbol of all. Not only can it substitute for all others aside from Scatters (which are represented by the silhouette of two Toucans flying with trees in the background at sunrise), five of them appearing on a payline will result in a 1,000-coin win which should cover your expenses for travelling to the island in the first place. As you explore the beautiful surroundings you will encounter Monkeys hanging from trees and the more of these you meet at once the better as five on a line bring a 500-coin win, plus you’ll need to keep a look out for green lizards as discovering these can bring rewards of up to 250 coins. You will also be able to pick up brightly coloured feathers which have fallen off the Toucans, pick tropical flowers, and there is a plethora of fruit to munch on or collect for the Toucans such as kiwi fruit, pineapples and pomegranates which are connected to colourful Ace to 9 icons which, as usual, have the lowest values of all. A beautiful and vibrant Toucan watches all of the action on the reels by standing either side of them and throughout the base game you could benefit from the Wild Bonus in which a Toucan adds an additional Wild to a reel, while in the free spins feature you could enjoy many more, including Stacked Wilds which are always welcome! Witnessing three or more Scatter symbols (the silhouette of the Toucans flying) means that it’s feeding time as the Toucans are feeling rather peckish. As a reward for all of the delicious fruit that you have provided them with during your visit to the tropical island, they reward you by activating a free spins feature which never fails to bring high-flying wins. Firstly, the more Scatter symbols you land to trigger the feature, the better. Three will bring you an instant win worth 5x your stake, four result in a win worth 15x your stake, while five bring the maximum win of 50x your stake, and that’s all before you receive 10 initial free spins. What’s most exciting about this feature is that the Toucans become even hungrier and as a bribe to encourage you to bring them more fruit, they add additional Wilds (up to 3 Wilds on one or more reels) on each and every spin, plus you can retrigger additional free spins to take your winnings to greater heights! 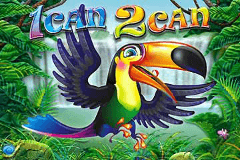 With a beautiful setting which never fails to put you in a relaxing mood after the most strenuous of days combined with the generous Toucans which fly over the reels to add additional Wilds, high-flying wins are almost guaranteed on 1 Can 2 Can!